As well as being a major buzzword and top “industry trend” for 2017, machine learning is a powerful tool with a lot of applications. It’s not just for medical diagnostics and high-stakes investing; today Big Data delivers a range of powerful insights for a variety of industries. It is no surprise that companies that feature AI in their tool-set have seen a 6x increase in funding since in the past 5 years, hitting an estimated $1.5 billion in 2016. With the sheer amount of customer data out there, retail organizations are specifically well positioned to take advantage of this Big Data revolution—but many companies are simply not engaged. If you are only using Big Data and analytics to build customer profiles, manage inventory and distribution, and target consumers based on demographics or purchase history, you are missing out. And missing out can cost your company significant opportunities and revenue. 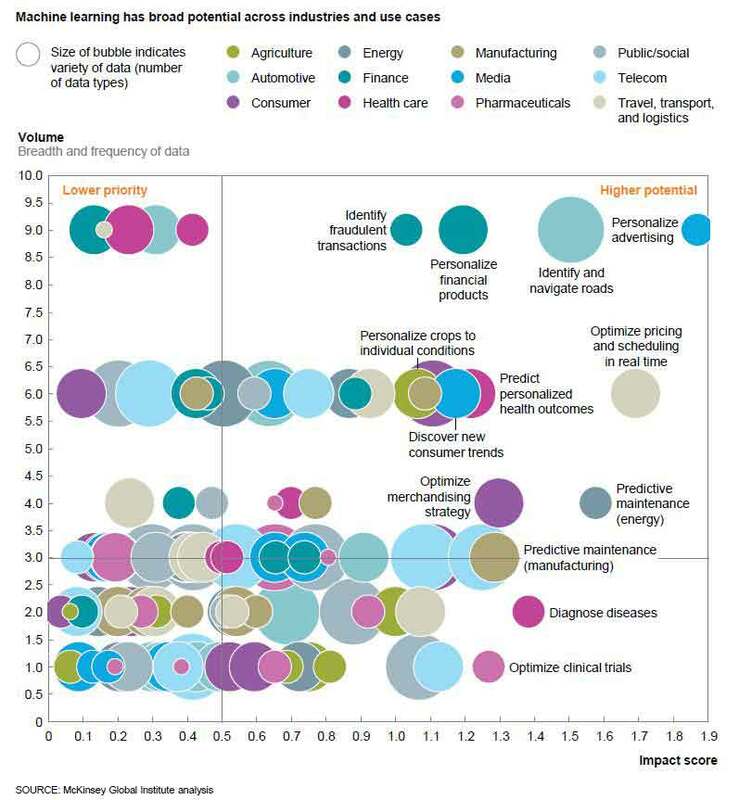 In fact, it is estimated that most industries lag behind when it comes to using data analytics, according to McKinsey & Company. Despite having access to a wealth of highly personalized and actionable information about shoppers and clients, most retailers are only using data analytics to develop very basic insights about their customers. But there is nothing simple about customer behavior. And while targeting based on age, gender, and purchase history is a good start, it doesn’t tell the whole story and creates a very incomplete picture. The result is cookie cutter profiles that lack the depth and dynamism to evolve with economic trends and shopping behaviors. And it doesn’t let you engage with customers at a deeper level through more advanced analytics. So, how can retail business tap Big Data for big results? Machine learning. J.A.R.V.I.S. or Just Good Business? Machine learning is nothing new. It’s been used across a range of industries from simple recommendation engines to complex cyber security platforms, and even manufacturing and medical systems. And it’s already in your home—and in your pocket. Because these systems can identify patterns that humans tend to overlook (especially in extremely large data sets) organizations are turning to machine learning as a way to identify and address issues, develop solutions to complex problems—and recommend your next binge-worthy Netflix selection. AI and predictive machine learning are also the next wave of customer retention tools, with big-time ROI. Machine learning is capable of processing vast amounts of data to identify patterns that can be used for a range of business applications. From predicting sales trends, to building complete customer profiles, to analyzing new data as it becomes available, these systems are changing the face of business and retail. For years, retailers have been faced with an interesting business problem. The internet, new payment methods, social media and other information channels have provided piles and piles of data, but they have lacked the ability to do much with it. Simply put, they weren’t able to distill the information quickly or accurately enough to make it actionable. Machine learning changes that by enabling retailers to see into the future, simulate scenarios, predict outcomes—even interact directly with customers and complete sales. However, despite all these capabilities and the fact that the future is here when it comes to thinking machines, that future looks a lot less like the Terminator’s Skynet (well, at least most of the time) and a lot more like Iron Man’s JARVIS. Several retailers have already jumped in. Macy’s On-Call (powered by IBM Watson’s machine learning and cognitive computing technology) assists customers as they shop Macy’s retail locations. Macy’s On-Call answers shoppers’ questions and gives location-specific details. This pivot to Big Data, AI, and learning machines is not restricted to the background. Brands engaging with these technologies want their customers to know about it. 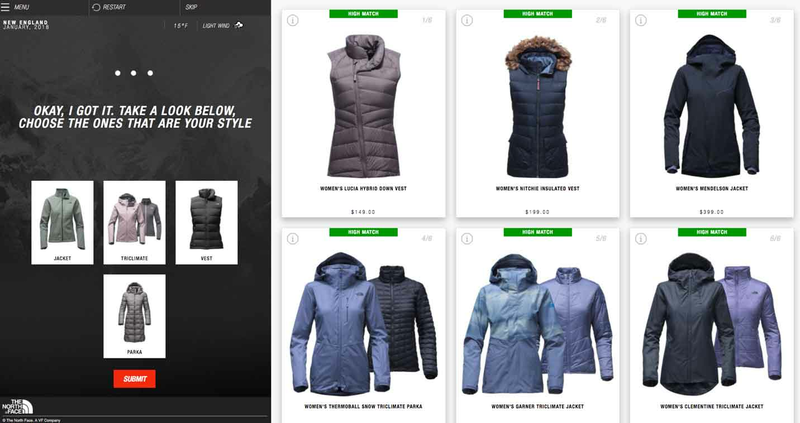 The North Face recently launched the Expert Personal Shopper, a tool to help outdoor enthusiasts find the perfect jacket for their next adventure. Even the launch screen leverages data analytics, by highlighting IBM Watson as a driving force behind the utility. Ocado, and online-only grocery retailers recently deploying a machine learning-enhanced customer support tool based on Google’s Cloud Platform. This system is able to sort and filter customer email by request while also keeping their information private—and then allows the retailer to respond with emails tailored to each customer’s specific issues. And it’s not just aimed at customers. Learning machines are helping business deliver better customer service, and foster employee development. Hyatt Hotels has embraced this technology—not externally, but internally as a training tool to help their staff provide better service. Hyatt’s learning system provides a set of machine learning algorithms. The automated mentor then observes employees’ behavior on the system and accepts their contributions to deliver personalized recommendations on content, connections and courses. The software becomes smarter and more predictive as users engage with it. The more an employee uses the system, the more recommendations are provided. Better data. Better predictions. Better results. The real advantage machine learning brings to the table—and the sales floor—is the ability to make better decisions. Predictions and forecasts that once relied on the human brain to select and analyze data have been replaced with machine learning systems that can crunch much larger pools of data and predict what will occur based on a much larger set of variables. In fact, U.S. retailer supply chain operations that have adopted data and analytics have seen up to a 19 percent increase in operating margin over the last five years. And those using data and analytics to improve merchandising—pricing, assortment, placement optimization—have seen an additional 16 percent in operating margin improvement. Here are 3 ways your organization can use machine learning to optimize operations and make better decisions. Retail businesses are known to be vulnerable to a range of market forces and sometimes razor thin margins between profit and loss. And there is a lot of competition out there, always trying to undercut on price, service, or value. In this environment, keeping up with your competitors is essential. But how can you really know what is going on inside another business? Sure you can read the trade magazines, press releases, and newspapers, and listen to market forecasts and review other public information, but unless it’s reported, you’ll never really know what is happening. That’s where machine learning comes in. By expanding your data pool to include traditional, non-traditional, and even seemingly disconnected sources, you can use analytics to paint a much clearer picture of what your competition and your industry are doing. Take social media for example: Social media can be a great way to learn about your competition. While less reliable than other data—social media is “social” and that means people provide different accounts of the same situation—it can be used to deliver quality information and insights. Algorithms are able to determine the credibility of posts or tweets, and analyze them against other posts, effectively lifting the truth out of a pile of unsorted tweets. It’s not just ultra-high tech products that are getting smarter. Everything is. And machine learning is a big part of it. Today, even consumer products are becoming smarter and more intuitive—a trend set continue over the next ten years as more and more products integrate into the Internet of Things. These connected products will be able to configure themselves based on users and their environments, fix themselves or upgrade software, operate by themselves, and they'll be able to communicate with other products and networks. Learning engines will help make sure your coffee is brewed to your taste, that your coffee maker is up-to-date with the latest software, and that your favorite beans are always in the house. It will even talk to the refrigerator to make sure cream and sugar are on the shopping list. It is often said that it is easier to keep current customers that it is to find new customers—that’s why customer service is so important. Machine learning can provide you with insights into what your customers want—and expect—by understanding their behavior at a granular level. These systems can easily discern between the customers that are beginning to use a product and those that have more experience with the product—or customers that need more support. In some cases, these systems can identify and address customer issues before they become problems. By breaking customers down into more precise groups and then providing service based on those need-states can result in service that builds stronger relationships. This can be especially effective with online shopping, where immediate virtual assistance can make or break the sale. Today, your marketing needs to be omnichannel, and machine learning can bring that same holistic view to your analytics. Consumers don’t want to be seen as part of a demographic group. They want to be individuals, they want to be reached on their terms, and they want service that anticipates their needs. Machine learning and advanced analytics can provide that level of detail and attention.